Oh man, I remember this set! I got to draft this set for the first time in years. 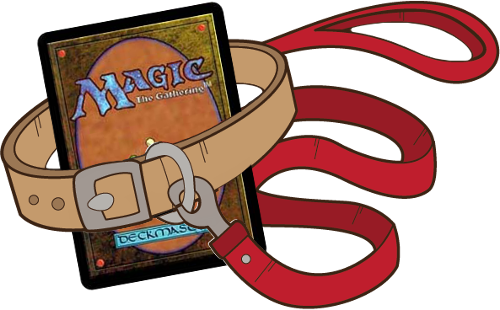 We sat down and did an in-home draft with a friend’s box, and it was super interesting. 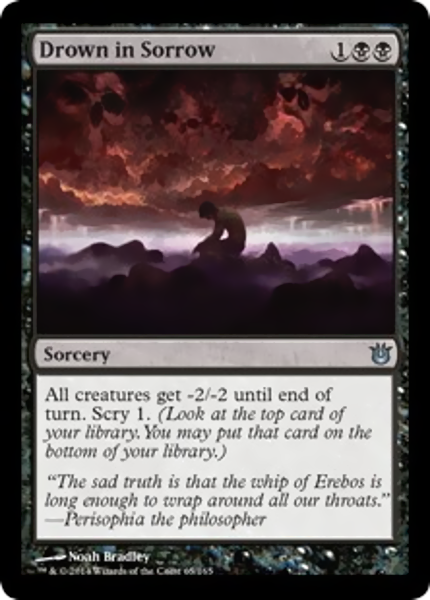 There was a wide variety of skill levels, and I lost – hard – to a runaway lifelinker with my mono-black aggro devotion deck. It was a lot of fun to play, though, and I remembered feeling that it was time to reboot my online account and get back to playing. I have quite a few staples from Theros block. As with Charms, and Cluestones and Gates in Return To Ravnica, there are plenty of perfectly good cards in this set to build around or to always have on hand, and the Gods of Theros represent some of the better bulk mythics you’ll fine. You’ll never be wild about using Temples in your mana base, but you’ll also never be that unhappy with them compared to most of the lesser alternatives. You’ll not always be able to make the best use of cards like Heliod and Pharika, but having them around as potentially useful cheap threats in midrange and control decks works out well. 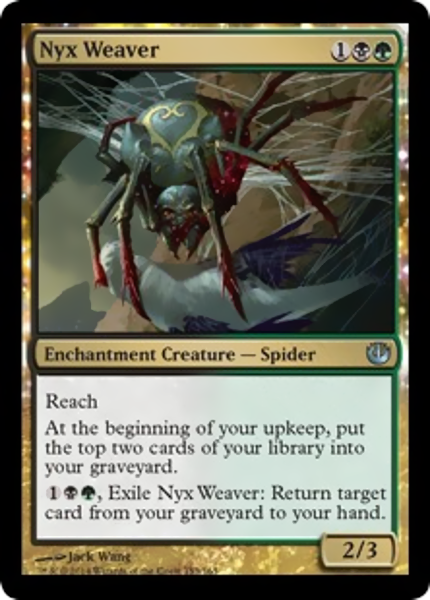 Oh, and Content Warning: I will show a card with a spider on it. Sorry! Abhorrent Overlord, and Fleecemane Lion (the Watchier Wolf) and live in their own decks as well, and I had some fun playing with them, but one of the cards that really stuck with me as I played with this set was this bad lady. But if I’m talking utility and big idiots, why in the world am I not talking about one of my favourite hybrids of both. 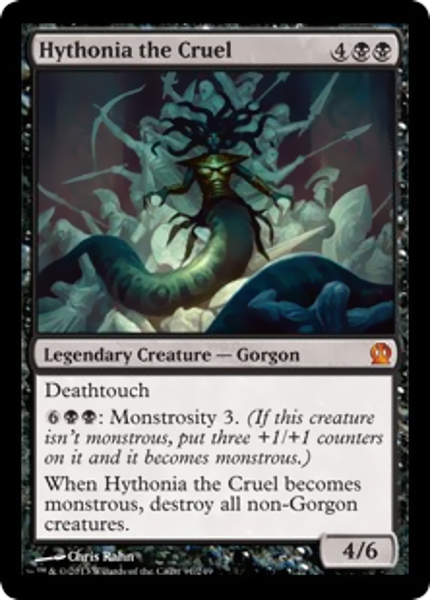 Hythonia the Cruel doesn’t turn the corner on her own, and she doesn’t curve out perfect (without Nykthos), but she’s a great Commander card to build around. Monstrous, she clears the board and kills an opponent in three hits – and if she’s killed, you’ve just reloaded her to go Monstrous again. She’s a great control commander card and I heartily advocate for playing with her for anyone who wants a budget start to playing a deck that feels more like a control deck. The Fine, But Okay cards of Theros block continue here, with special mentions towards Raised by Wolves, which is both rich and flavoursome and also just nicely on curve for a virtual-hasted creature that can still be beaten in some interesting ways. And hey, works in a Wolf deck, though you might not see a lot of those. I also really like some Enchantment creatures, like Ephara, God of the Polis, Eidolon of Countless Battles and Courser of Kruphix, though Courser is kind of a predictably known ‘good card’ for casual decks. Champion of Stray Souls is a good in for dredge decks, since it can recur itself and change your game position if you’re just grinding out slowly. Oh, and obviously, Brimaz, King of Oreskos is a Jeskai control all-star, because he wins the game in a terrifyingly swift order once you get him out. It’s easy to control the game if you only really need to serve four times. Here’s a bit of a weird one. I quite like Infest, a handy cheap semi-wrath that you can build around. It sits somewhere between Pyroclasm and Wrath of God for wrecking boards, but it isn’t one that invites you to avoid investing in the board. If you play creatures that can weather or even exploit Infest, you can use it for cool things in a midrange deck. You don’t need to control the game so long if you can Infest and still swing for 2-3 points of damage. And Drown in Sorrow is a straight upgrade over Infest that I keep forgetting when I build decks with Infest! The spicy stuff in Nyx is mostly creatures that reward decks you might already be playing. Big White can treat Quarry Colossus like a bigger Flametongue Kavu, spot removal to follow up your wrath effects. Prophetic Flamespeaker rewards a sort of red-fish strategy, where just getting through yields rewards. Riptide Chimera can reuse Auras and constellation effects, but also the Ravnica cards like Flight of Fancy, and it’s a solid hitter on its own. Squelching Leeches replaces Nightmare for cheap, Mogis’s Warhound gets pseudo-haste if you have another creature to stick it to in an aggressive red deck, and Aegis of the Gods offers players a kind of confidence they rarely need but are always happy to have. And Hydra Broodmaster deserves a mention as one of the rare Green outlets for infinite or Just A Lot of mana that you can activate at instant speed, instead of having to hope nothing happens in the mean time. Still, it isn’t what I’d see as my favourite Nyx card, because this one, I have played with a lot. Gosh there are a lot of nice abilities on this card. Nyx Weaver fills your yard, which I like. It can be cashed in, in the late game, as a Regrowth, which I also like, and you can even break up the payment over time. You may need to spend six to pick something up right now, but you could instead spend 3 to put down a blocker, keep up 3 to kill something with a Putrefy, then pick up your game-winner in an end step. It even has Reach, so it can in a pinch block something pesky on the way out. I love you, Nyx Weaver. You’re an adorable little dream spider of yesterday.